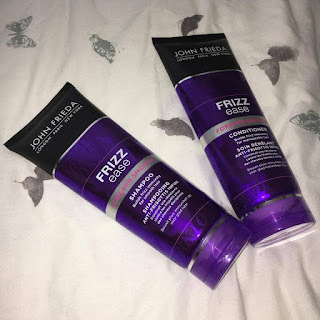 I am a strong believer in changing up your shampoo and conditioner every so often so while I don't have the income or storage space to leave products half used, when I have finished using them, I never buy the same product brand again. I think your hair gets used to the product so the benefits you originally bought the product for fade away. I love Tresemme and Herbal Essences, I've also been a fan of L'oreal and Pantene but my favourite is Kerastase. Unfortunately, that is extremely expensive so I've never bought it myself, instead I just steal my mum's when I'm home! 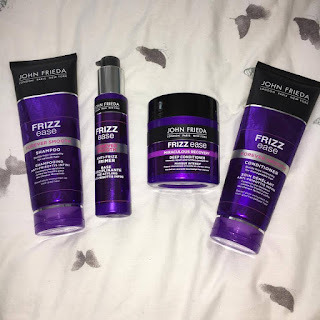 I've had a lot of static hair recently so this time round I decided to try the new collection by John Frieda. The Frizz Ease Collection! I bought all my products through Birchbox as I had points to spend so I ended up getting a massive discount. 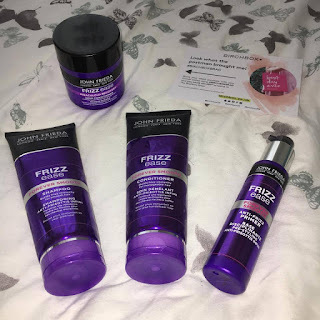 I've now used the products for over a month so I've decided to share my thoughts on the products. Contrary to beliefs, this is not a purple shampoo so it will not tone down your colour! I love these. Obviously, I'm not going to review them separately as I've only ever used them together so I wouldn't know the effect of one. They smell divine and I actually think my hair feels really clean afterwards. I really like that the Conditioner is quite moisturising so I feel like I'm nourishing my hair. Only negative I have is that the Shampoo defintely stings when it goes in your eyes. Ouch! I'm not a complainer of my eye stinging usually but it was defintely noticeable for a good few minutes so be careful when using it. 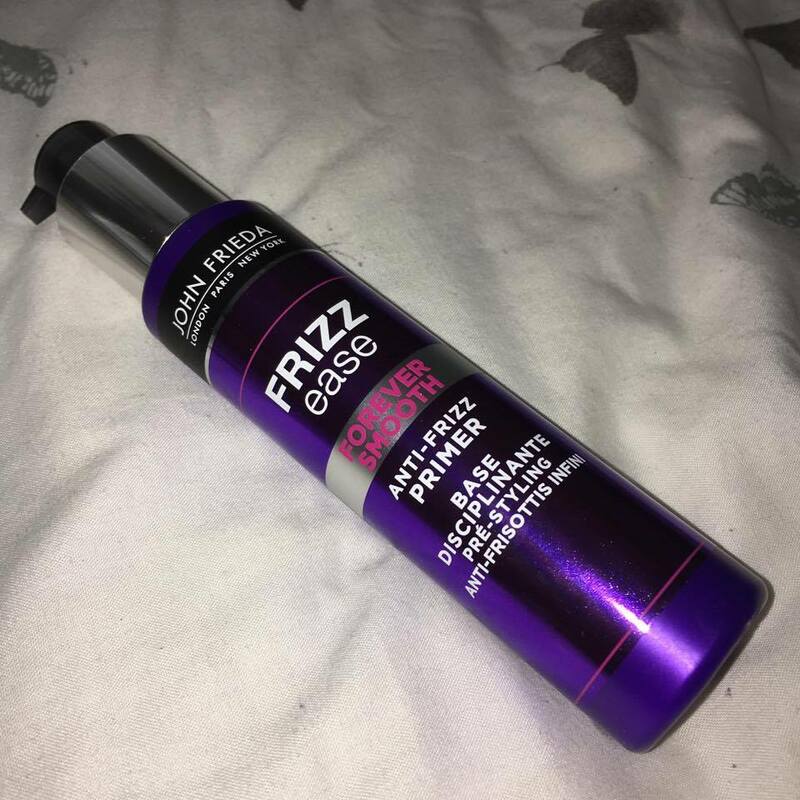 I have never ever used a primer on my hair before but I thought since I was buying a lot of the range I would buy this too. I was a little shocked when I first pumped it because I thought it was going to be like a mouse-foam product but instead it's more of a light cream. Admittedly, it does make my hair a little greasier than usual but I'm still only washing it 2 to 3 times a day which works for me. When I first used it, I thought that no way was one pump going to cover all my hair so I ended up doing 3! I was wrong. My hair is super thick and relatively long, although personally I would call it midlength. Even still, only do one pump! The extra pumps go in fine but on drying the hair, it leaves it tacky and with a sticky residue which is not the greatest feeling but you can't tell by looks. If your hair is quite thin, I would even recommend half a pump. A little goes a long way which is actually great because it means the product will last a long time. One of my favourite things is the lock mechanism. I keep all my hair products in a basket on the top of my wardrobe so I wasnt to make sure nothing can spill. Cleverly, the pump twists 90 degrees to lock the pump and then reverse to allow pumping. I've been looking for a deep conditioner or hair mask for years and I am so happy that I've found one that I actually like and is reasonably priced. I did have to wait on a waiting list for this for a few weeks so it's defintely popular but it's obvious why. The tub is massive and you hardly use any product each time. I like to use this once a week for that extra deep moisturising effect and I love it. I love that you don't have to leave it on for ages because 5 minutes gives you time to do other things: shave, wash your body, contemplate life. 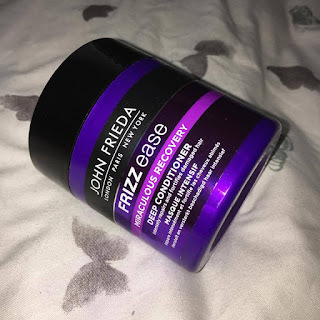 I have a dry scalp sometimes so I was hoping this would just help add a little moisture and while it didn't do all that much for that purpose (any hair mask recommendations? ), it left my hair feeling so soft and it feels like it does when hairdressers wash it. Overall, I'm really pleased with the products. I'm glad I made the little splurge to buy the full set because I do feel like the products complement each other well. It defintely reduced the static from midshaft down. I can now play with my hair without getting all the fly away and it sticking to my first. It straightens and dries so much more naturally which I love because it doesn't need much doing to it. The only things it doesn't help with is all my fly away baby hairs on my roots. It didn't say that it would but I was secretly hoping. A quick note I would mention is that this isn't necessarily a quick fix, although I did notice a massive difference on first wash. It says that they work by 'building frizz immunity' and it defintely get's smoother each wash.